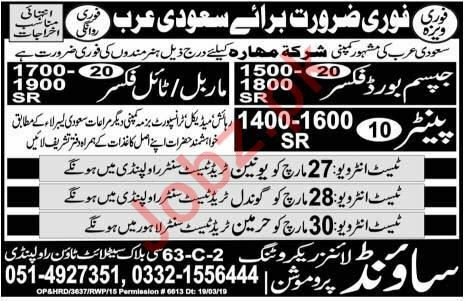 A well reputed and well established company is looking for Gypsum Board Fixer, Marble Fixer, Tile Fixer, Painter in Saudi Arabia. Interested candidate can apply. Candidate must have experience in relevant field. You can apply online at vacancy after registering at http://www.jobz.pk site.